Beaducation: The Blog: Stamp 'em and Stack 'em! Stamp 'em and Stack 'em! We've got the skinny on these new Thin Stampable Rings at Beaducation! Do you find yourself wanting a more dainty ring? Do you like the look of delicate layers? Do you want the freedom of mixing and matching your rings? If you answered "yes" to any of the above, stacking rings may be your thing! Thin sterling rings are all the rage right now. Jennifer Garner is sporting a stack of diamonds and Nicole Richie is stacking her finger bangles. 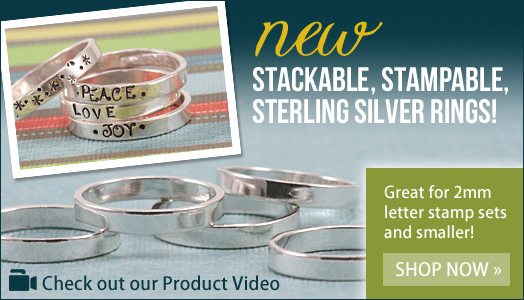 The versatility of our Thin Sterling Stampable Rings allows you to personalize each one of them. You can stamp your loved ones' names on them, your favorite cities, favorite emotions -- just about anything! Mix and match them too! Nicole Richie even stacks her thumb! The rings measure 3mm wide with 2.9mm of stampable surface. This makes them perfect for your 2mm Letter Sets and smaller. In our sample above, Lisa has stamped 'peace' and 'joy' with our 2mm Uppercase Kismet Set and 'love' with the USA Made, 1/16th Block Uppercase Letter Set. She uses our 1/16 Asterisk Design Stamp and our 3/32 Period Design Stamp for the designer ring without words. Before you start stamping, we recommend you watch our Stamping on Rings Class. This video will show you the tools you need to begin stamping on a premade ring. Because the stackable rings are less than 3mm in width, they can be tricky. We created a Stamping on Thin Rings product video where Lisa shares specific tips and tricks to set you up for success. To get started, draw two parallel lines 2.9mm apart on a piece of Copper Sheet to practice between before you stamp on your ring. Once you are comfortable with the space, all that's left to figure out is how many rings you can fit on your fingers! Darling! These look like fun! A jewelry like this, preferably a designer rings will get the attention of one's eye if placed in a package that would make a person's heart leap in excitement. It will not only capture the eye of the buyer but as well the heart of the receiver.